Disasters, ethnic conflicts, and war destroy millions of lives and billions of dollars each year. Survivors lose their loved ones, homes and livelihood. They suffer severe distress, fear and hopelessness. 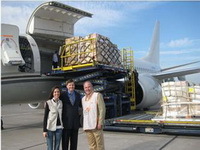 Family Care Foundation project managers oversee large-scale relief activities. We were there on the shores of India, Indonesia, and Thailand with tents, blankets, food and water after the Asian tsunami, at the earthquakes in Chile, India, El Salvador, Turkey, Colombia, and Taiwan; at the site of Hurricane Mitch; at the floods in India and Mexico; and at the US Embassy bombing in Kenya. Family Care Foundation partner services include extensive follow-up and counseling to meet the vital, but often overlooked emotional needs of the victims. We frequently work in close cooperation with government agencies.